100 Pandas Slot Machine - Play Free at Slotorama! One of the most playful animals on the planet comes from deep within the Chinese jungle and onto your screen with IGT's 100 Pandas slot machine featuring the fantastic Stacked Wilds Feature. One of the most playful animals on the planet comes from deep within the Chinese jungle and onto your screen with IGT‘s 100 Pandas slot machine featuring the fantastic Stacked Wilds Feature. The game has 100-paylines stretched across 5-reels against the deep green of the Bamboo shoots and leaves. You can hear pleasant Asian music play when you spin the reels accompanied by the soothing sounds of jungle life like birds, insects and monkeys. 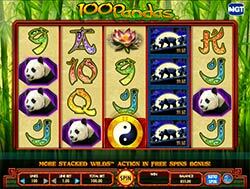 On the reels you’ll find the Yin Yang symbol which is a scatter that can award free spins, a family of three pandas which is the wild symbol, a Panda against a purple background and another against a green background, a lotus flower, bamboo shoots, and traditional card symbols nine through ace. Be on the lookout for combinations with the first two symbols in them so you can win big with free spins and stacked wilds! Stacked Wilds – The Panda family walking in the moonlight is Wild and substitutes for all symbols except the yin yang scatter symbol, to complete winning combinations when possible. Yin Yang Free Spins – Landing 3 Yin Yang scatters on reels 2, 3 and 4 will pay you 2x your total bet and earn you 10 free spins! During free spins if you hit the symbol again on the center three reels, you’ll earn an additional 10 free spins up to a maximum of 255 in a row. During the free spins round you can still get Stacked Wilds and in fact, they actually become more frequent making the free spins even more valuable.